Standing alone on a hill in the Murgia Pugliese region is Castel del Monte, the most famous monument of the time of Emperor Federico II of Svevia. Castel del Monte has a unique octagonal plan, in the centre of which is an octagonal courtyard, thought at one time to have housed a swimming pool. Eight buildings, also octagonal, stand at each corner. They look like towers but they are no higher than the body of the castle, and from a distance the building looks like a crown. Here you can also buy the famous dessert wine “Moscato di Trani”, as the restaurant's owner produces an excellent homemade variety. 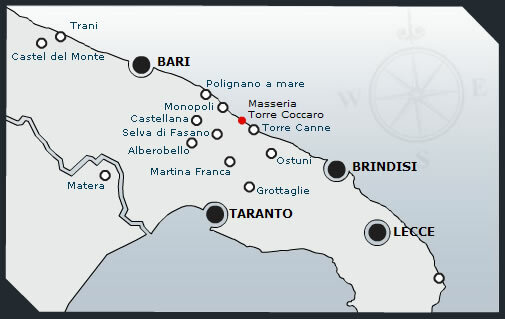 The tour begins from the Castle, then reaching the Old Town or historic centre, encircled by Corso De Tullio which runs alongside the new port, and the coastal road Imperatore Augusto. Further on, we come to the Romanic cathedral, dedicated to S. Sabino. Inside we find a crypt whose altar conserves the relics of S. Sabino and the icon of Madonna Odegitria. The basilica of S. Nicola is imposing, and inside lies the crypt supported by 26 columns with Byzantine and Romanic capitals. Beneath, there is the tomb of S. Nicola. The basilica is also home to a Museum, which houses the church's precious treasure. Continuing our visit to the historic centre we come to Piazza Ferrarese. For a visit to the shops, the visit ends in Via Sparano, one of the best-known shopping streets. Polignano stands on the summit of a sheer rocky cliff overlooking the sea, full of natural grooves and marine caves. Once inside the historic centre, visitors can admire the many terraces overlooking the sea. The Palazzo del Feudatario, the residence of the lords who governed Polignano for years, is an imposing sight and visitors will be struck by its powerful profile. In the square named after Vittorio Emanuele II, formerly Piazza dell'orologio, named because of the large clock that stands there, is the Chiesa Matrice, one of the oldest and most important buildings in the town. It catches the eye because of its large quadrangular bell tower. Outside of the historic centre is an old port which stands on the large inlet named Cala Paura, a natural phenomenon of unparalleled beauty. Restaurant: "Chichibio", Largo Gelso, 12, Tel. 080.4240488; typical, fish specialities. "Donna Gina", Via Porto 7, tel. 080.4240914. Beautiful view, fish specialities. "Da Tuccino", Via S. Caterina 69/F, tel. 080.4241560, fish specialities. The visit to the caves begins with a descent into the first immense cavern, along an undemanding staircase. A natural, square skylight illuminates the Grave with natural light. This is an immense pantheon that begins the subterranean excursion, and immediately afterwards we enter the Grotta Nera (“Black Cave”). From the Black Cave, we come to the Cavernone dei Monumenti, approximately 40 metres high, in which large stalagmites rise from the ground, to enter the Corridoio dell'Angelo. After the cave visit, we move on to the historic centre of the town of Castellana, with its many noble residences. Of interest is the Chiesa Madre, full of Renaissance and Baroque paintings, while the church of S. Francesco d'Assisi is home to elaborate Baroque altars. Outside the historic centre, we come to the Convent of Franciscan Friars, where the annexed church is dedicated to the Madonna della Vetrana, patron saint of Castellana Grotte. The convent also houses a beautiful, historic nativity scene. Alberobello, famous throughout the world for the characteristic, conical houses known as “trulli”, is divided into two districts: Monti and Aia Piccola, both national monuments and UNESCO world heritage sites. The history of this unusual little town dates back to the second half of the 16th century, when the Counts ordered the farmers to build the limestone houses in dry layers, so that they could be destroyed if there was a royal inspection, since the creation of an urban settlement meant that taxes had to be paid. In the Monti district, attractions to visit are the church of Sant'Antonio, the Trullo Siamese and the two-storey Trullo Sovrano, while Aia Piccola is the zone which best represents the idea of the old medieval village. Visitors can admire remarkable handicrafts, such as the art of embroidery, or buy many local souvenirs. An unforgettable attraction is the Casa D'Amore, with an inscription on the facade as a record of the townspeople's victory over the ban on making alterations to the trulli, imposed by the Counts of Conversano. the 18th-century Palazzo Palmieri. Finally, next to a small Apulian-Greek rock church, the Abbey of San Stefano stands on a cliff, embraced by two small inlets. Excellent ice-cream at the Iridium bar near the village or Caffè Roma in Piazza del Pesce. Restaurant: "La Torretta" Fish specialities and also an excellent pizzeria, Via Procaccia 191, Tel. 080.8876722 Shopping: high class menswear at UOMO. 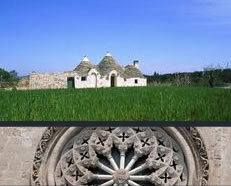 Selva di Fasano is a holiday resort famous for its wonderful panoramic position. Known as "Italy's balcony to the East” you can also admire the view of the Valle d'Itria to the west, and the Adriatic coast to the east, dotted with ancient olive trees and the historic, unmistakeable stone buildings, the famous Trulli. The nearby safari park offers various attractions, where you can visit the largest wildlife park in Italy. Torre Canne is a small fishing town which comes alive in summer, transforming itself into a bustling seaside resort with lots of attractions, offering superb hospitality and a magnificent sandy beach. Torre is also a famous spa town with its springs Torricella and Antesana, whose waters are drunk to cure complaints of the liver, biliary ducts and uricemia. Strolling through the old town, even without a specific destination or itinerary, everywhere you look you'll find something new and exciting to see, the unexpected sophistication or genuine simplicity of Baroque buildings, the scents and flavours of the old and the new. The fountain in Piazza Roma is strikingly characteristic, the historic centre of Martina Franca, with its unique artistic attractions, awaits visitors with a maze of alleyways and enchanting little side streets. The Basilica of S. Martino, a splendid church and universally acknowledged to be one of the most successful renditions of the town's unique style of Baroque architecture. Finally, don't miss the elegant Baroque church of S. Domenico. Restaurant: “Al ritrovo degli Amici”, corso Messapia, 8, Tel. 080.4839249. Traditional vegetable and meat dishes. Shopping Boutique Massa in the main square, selling designer Italian clothing. Antiques market every third Sunday in the month. Info tel. 080.4304951. The commercial dairy Barnaba, Via Mariucci, 10 sulla Martina - Alberobello. Excellent capocollo sausage from Romanelli, at Via valle d'Itria 8. Nicknamed the White City with its medieval village known as "terra". We start from Piazza Libertà, a large, triangular square bordered by the municipal buildings, the Church of San Francesco, the Obelisk of Sant'Oronzo and the Church of the Holy Spirit. Entering the town from Porta San Demetrio we encounter the medieval village with a long uphill climb amid arches and white limestone walls. We arrive in Via Cattedrale where we can admire the facade of the Church of San Vito Martire, currently a museum, home to the model of an extremely important archaeological discovery: the remains of a woman with her unborn child dating back over twenty-five thousand years (Late Paleolithic period). Leaving the museum, we head towards Piazza Cattedrale, with an incomparably beautiful architectural and artistic view: the Cathedral (a national monument), the Episcopio and the Library, the stone bridge. Along this route, visitors have the chance to sample typical produce (oil, wine, orecchiette pasta, dairy products, desserts, dried figs, roasted almonds, preserves and rosolio liqueur) and buy fine handcrafted items (wicker baskets, lace and embroidery, items carved from olive wood, clay whistles and ceramics) from the many little shops along the streets in the historic centre. A craft speciality of this town is pottery, in the form of small whistles, miniature terracotta masterpieces and all manner of weird and wonderful objects. The abundance of clay found locally was the main reason behind the development of craftsmanship dating back to the classical and Magna Grecia age. Places to see include the ceramics quarter, with dozens of ceramic craftsmen. In the historic centre, you can watch valuable items being painted and fired with the best and most traditional of techniques. The “Castello Episcopio” (archbishop's castle) ancient medieval keep dating from the late 15th century, now home to the Ceramics Museum; the imposing Chiesa Matrice in Piazza Regina Margherita; The Sanctuary of S. Francesco De G. dedicated to the Patron Saint and home to a splendid stone nativity scene dating back to 1530. In the rest of the town, there is the Sanctuary of Madonna di Mutata (with adjoining country house) built in remembrance of a miracle attributed to a fresco of the Virgin Mary which “changed position”. Visit the ceramics quarter with dozens of ceramic artists. Taranto's archaeological museum is outstandingly beautiful, and has a great new attraction: the Salone degli Ori, a collection of gold and silver presented at travelling exhibitions in various parts of the world. Particular attractions among the pieces of jewellery originating from Taranto include the remarkable gold-leaf tiaras in the shape of bay or oak leaves. Apart from gold and silver, a large part of Taranto's museum is dedicated to ceramics, which mostly come from excavations carried out in the city. In the historic centre of Brindisi in Piazza Duomo, next to the ancient portico of the hospital “dei Cavalieri Gerosolimitani” stands the Provincial Archaeological Museum, named after Francesco Ribezzo, a scholar of Messapican culture. Inside, don't miss the collection of writings, the collection of statues depicting men wearing togas and armour, and the antique section. La bohème, via Fermi 42, industrial zone. Antique shop. Lecce has a very special Baroque style because it has a secret all of its own, a formula not found anywhere else: the unique quality of Lecce stone. A compact-grained marbled limestone that is soft enough to be sculpted with a chisel and a hatchet. The best example of Baroque architecture in Lecce is the Basilica of Santa Croce. The second port of call for visitors exploring the streets of Lecce is the Duomo with the adjacent Palazzo del Seminario, but all of the cathedral square, with the bell tower and remarkable well which is the symbol of Baroque Lecce, creates a marvellously unique scene. Piazza Sant'Oronzo with its amphitheatre, and the imposing column of S. Oronzo, are unforgettable. Other Baroque buildings in Lecce are the church of Santa Chiara, with a richly decorated portal set in an elegant facade, the church of Saints Niccolò and Cataldo. On entering the streets of the historic centre, you can admire true artistic masterpieces and browse through the countless little shops and workshops displaying typical handicrafts. Moving away from the town centre, you can visit the castle of Carlo V, with the Villa Comunale just a little further on. You can admire splendid examples of “chiacchierino”, a very fine kind of cotton embroidery, worked with a little shuttle, forming a kind of spider's web of concentric patterns. Restaurant “Cucina Casereccia”, Via Costadura, 9; tel. 0832.245178; traditional Salentine food, vegetables and meat. Antiques market, every fourth Sunday in the month, for info. tel. 0832.308510. Beachwear from “Cheeky pay” Via Zanardelli, 35. “Gli Archi”, Via Libertini, 58 - Historic prints. “Bottega Antiquariato Salentina”, Via Acaya 10. Matera is famous for its superb historic centre, especially the most characteristic districts, Sasso "Caveoso" and Sasso "Barisano", now known as the Sassi di Matera, featured on U.N.E.S.C.O. 's list of world heritage sites. Over the centuries, the houses to the extreme south of the town have been increasingly used as cellars for the production and storage of wine. In Civita, the oldest part of the town, the attractions include Piazza Duomo and the buildings overlooking this square, including Palazzo Gattini and Palazzo della curia. Famous tourist town with a beautiful historic centre. The Cattedrale dell'Annunziata or Crismatico is the largest church in Puglia. It houses the relics of the martyrs of Otranto. Inside, the imposing thousand year old mosaic of Pantaleone depicts the tree of life. Painted by a monk from the Abbey of S. Nicola di Casole, this is the only work of its kind in the South of Italy. A walk through the streets leading to the cathedral is particularly memorable. The streets are extremely narrow and wind through the white houses full of tiny workshops selling unusual handicrafts and painted ceramics. The visit ends with a walk along the seafront to admire one of the most beautiful sea views in Italy. Restaurant: "Acmet di d'alba Lucia", Via lungomare degli eroi, fish specialities in the heart of Otranto. "Art'è", along the coastal road of Terra d'Otranto, painted ceramics.